The manacorense travels Friday to the capital of the Principality, which houses the first 1,000 Masters on clay of the season. It seems recovered from tendonitis. The 1000 Masters of Monte Carlo, the first major claycourt tournament of the tennis season, is just around the corner (the main draw starts on Sunday) and Rafa Nadal hastens his preparation to face the debut on his favorite surface with guarantees. 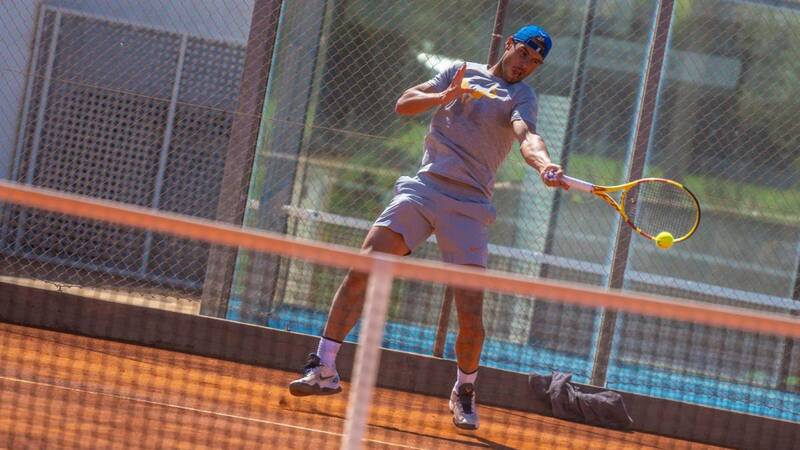 The manacorense published on Thursday a video on his Instagram account training in his Academy before traveling this Friday to the glamorous capital of the Principality of Monaco, in which he has shone 11 times already and aspires to a twelfth crown that would be a record, because nobody has won so many times a tournament of the ATP calendar. In the video Nadal is comfortable, despite the relaxed atmosphere of training moves with ease and gives symptoms of recovering from tendinitis in his right knee that forced him to retire in Indian Wells minutes before his semifinal match and give up playing in Miami. Despite his absence in the Masters 1000 of Florida, Nadal has retained the second place in the ATP ranking and therefore will be the second seed in the draw to be held this Friday (18:30) in Monte Carlo after Novak Djokovic and ahead of other players to consider as Zverev or Thiem. For the Balearic will be the beginning of a journey on the brick dust that will take him to the Godó, the Masters 1,000 of Madrid and Rome and, finally, his mecca: Roland Garros. At an event held today in Manacor, Quirónsalud has become the new Official Medical Service of the Rafa Nadal Academy by Movistar. The agreement has been sealed in the Academy's own facilities In a meeting in which Rafa Nadal and Hector Ciria, CEO of Quirónsalud. Hector Ciria, have been very pleased after announcing this new initiative: "For Quirónsalud, joining the Rafa Nadal Academy means sharing the values of Rafa, such as effort, passion, responsibility, humility and respect. Values and an attitude recognized worldwide, both inside and outside the tennis court. It is an honor, a pride and a luck for Quirónsalud to be able to accompany him in this project ". Rafa Nadal himself wanted to highlight the importance of the agreement for the Academy: " For the Rafa Nadal Academy by Movistar it is a pleasure to have Quirónsalud as part of this project. It means security, it means quality and it means excellence. We will make this journey together by helping young people to improve their healthy living standards and their physical condition, through proper prevention and with all the care and treatments a young athlete needs. " Sports is a field that, in addition to being related with health both in the prevention of diseases and in the quality of life, it reflects a series of values with which Quirónsalud identifies itself and that fosters in the way of working: the effort for continuous improvement, the spirit of improvement and work in equipment as a guarantee to offer the best to society. In addition, as Hector Ciria said later: "first level athletes require first level medical care, because excellence in sports, as in any other facet of life, can not be achieved without taking care of health ". For this reason, Quirónsalud has been supporting sport for many years as part of its social commitment, assuming the Medical Services of the MotoGP World Championship and sponsoring the 49er Quirónsalud Olympic Team, as well as taking care of the health of participating women each year in the Pelayo Vida Challenge, an initiative framed in the Universo Mujer Program. And in 2018 Chirónsalud joined, as Official Medical Provider, the Nationale-Nederlanden San Silvestre Vallecana. Likewise, its hospitals are reference centers for major competitions such as the Mutua Madrid Open and the Madrid Horse Week, among others. "To now also become the Official Medical Service of the Rafa Nadal Academy represents an important step forward in the involvement of Quirónsalud with sport", has pointed out Ciria.